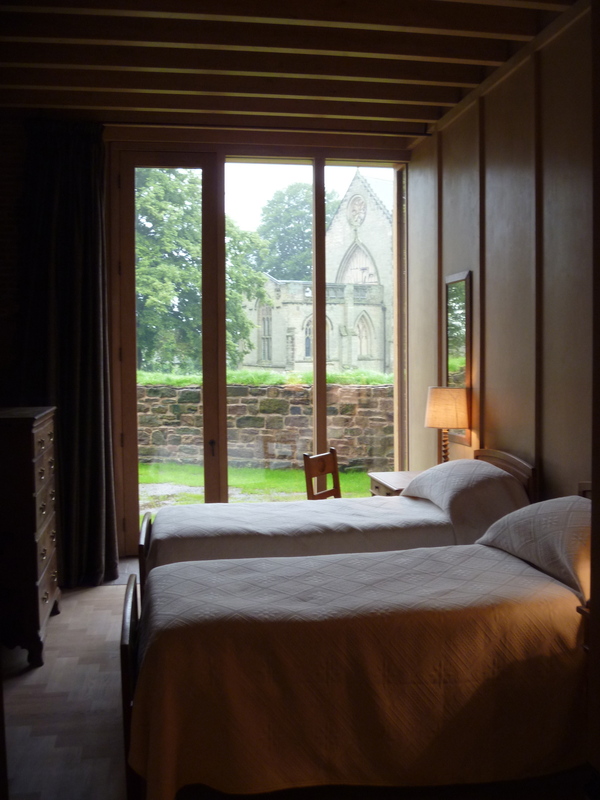 Staying at the Castle you are invited to call one of the churchwardens (numbers are given in the Information File) in order to arrange a personal tour. I decided to do this and at 10.30 the other Thursday met Judith who was able to show me changes that had taken place since my last visit and to explain lots of the features of the church. Here is how the Welcome Leaflet briefly describes the church and its ‘treasures’. “We know that a church existed at Astley as early as 1285 because a priest was appointed in that year. However, what remains today contains part of the church that was built in 1343 together with some additions that were built in 1607/8. The 1343 church was built in the form of a cross, with a central tower which had a lead covered spire. After dark a light was always shown from the spire which was known as “The Lantern of Arden”. The light was to guide travellers through the thick forest which surrounded the area in those days. 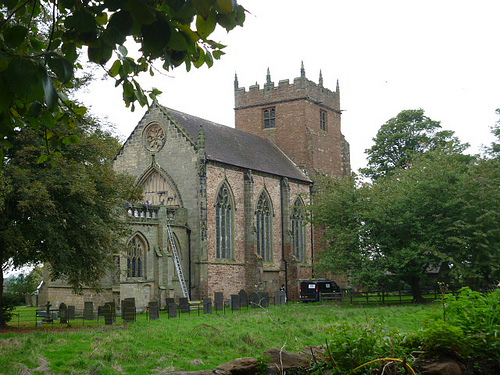 The church’s purpose was a chantry for Thomas Astley. here priests sang mass daily for both him and his family to aid their souls in purgatory. Over the years the church has passed ownership through Sir Richard Chamberlayne to the Newdegate family. The main body of the church was about 30 m. long but by 1600 the tower had fallen down and the church was in a state of disrepair. The east and north windows contain some 14th century stained glass whereas the south window is modern. This dates from the 17th century and depicts the taking down of Our Lord from the cross. It was given to the church in 1905 by Sir Francis Newdegate. A stone circular staircase leads up to the bells of which there are five. Four of these have an inscription showing that they were made in Leicester in 1607. This is made of oak and has twenty one shields connected with the church. It was extensively restored in 1876. There are six on the south wall showing seven Bible passages, the Lord’s Prayer and the Creed. There are two sets of nine and behind each stall is a painted panel. There are nine apostles on the north side and nine prophets on the south side. Now blocked, this window would have been at the end of the original church. It sits above the 17th century chancel arch. Some of the stained glass from this once magnificent window was moved and placed in the windows of the north side of the chancel and also in the tracery in some windows in the nave. Amongst many generous donors towards the reconstruction of Astley Castle the Heritage Lottery Fund was one of the major ones; giving a grant of well over a million pounds to help the project on its way. HLF grants come with strings attached. So Astley Castle, quite rightly, enjoys many features and events not normally connected with Landmarks, in which the general public may be involved such as local school visits, open days and living history weekends. Public involvement has also included art exhibitions and a competition to design an Elizabethan knot garden in the grounds. One excellent result of the HLF involvement lead to the establishment of an Interpretation Trail on public footpaths through the area surrounding the castle (but keeping to the other side of the moat!). Information boards along the route explain the views and relate the history of the castle and its royal connections. Of course, I walked this trail many times in both directions. The views changed as the weather and light did throughout each day. 1. At The Astley Reading Room two boards give a general introduction and explain the creation of Astley Castle as a ‘Landmark for the 21st Century’. 2. 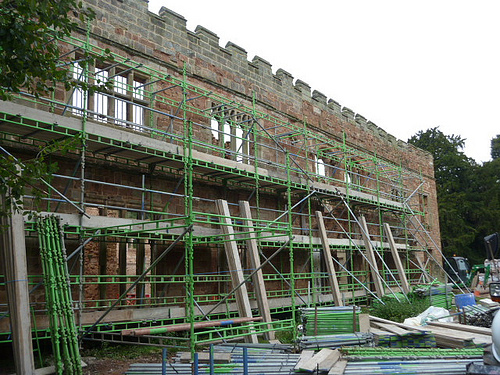 Astley Castle : South Elevation. Staying at the castle; this is where I began the trail each time. From here there’s an excellent view of Astley Church of St Mary the Virgin. [To be the subject of another post] Proceed through the churchyard to a rather muddy lane and panel 3. 3. The New Garden. “Today the New Garden is used as pasture but the many lumps and bumps hint at significant buried archaeology, especially in this north-western corner” [Interpretation Board] In fact from this point we re-enter the Castle grounds and here are ancient fish pools and a man-made ‘Viewing Mound’. “There can be no real doubt that the New Garden was designed as a garden for the adjacent castle and it was probably laid out with paths, raised-bed type planting, arbours, hedges, and seats, perhaps in the late 15th century. The viewing mount could date from this period too.”. The area is labelled as New Garden on this estate map dated 1690. 4. Little Park and Shrubbery. Here we leave the meadow and pass through a gate into a small wood or copse now known as The Shrubbery. It contains the kind of cultivated shrubs popular in the 19th century and is only shown on maps as a separate area on maps of the late 19th century and after. 5. East Elevation and The Plash. Emerging from the Shrubbery we gain another view of the Church and the Castle. The East Elevation is to all intents and purposes the Front and Entrance to the building. 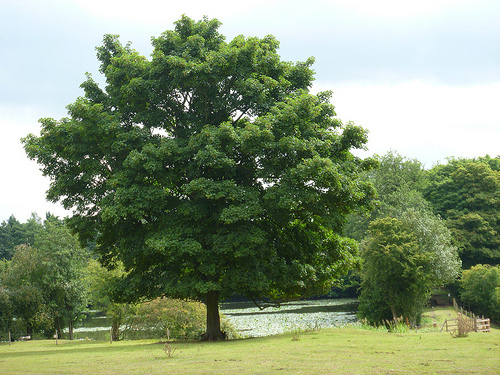 But looking in the opposite direction there’s a broad green meadow (The Plash) and the still waters of the Astley Pool fishing lake. 6. Astley Pool and New Road. Our path takes us across The Plash to Astley Pool, a man-made lake. Although it may seem a typical 18th or 19th century creation it is first referred to in 1501. It is now a private fishing lake. 7. Dark Lane and Castle Approach. The BTCV volunteers had been busy clearing the last lane that leads back to the village and the Castle. I was surprised to read in the interpretation notes that this lane was in fact a disused ‘holloway’. I have recently read Robert MacFarlane’s recent book “Holloway“. I had assumed that these features of the landscape only occurred in Dorset and the Downs of the South of England but here was one in the Midlands. And here we are back where we started at the approach to the castle. On the left is the Coach House like the Castle left to ruin but now repaired and water-tight although it has no use at the moment. Behind are the 18th century Gothick stables. 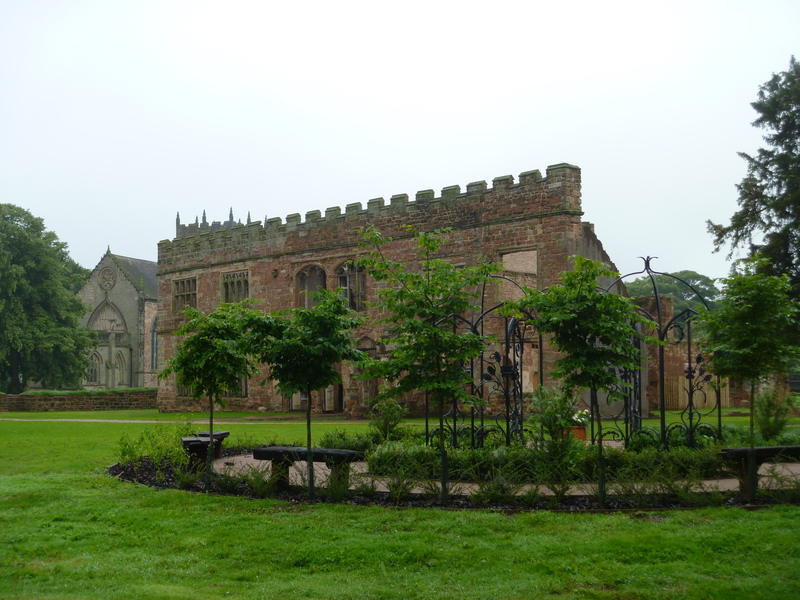 I return to the Castle to study the library and read more about ruins and the rich history of Astley and England. “The Building Bears Strong Marks of the Ravages of Time and Presents an Extremely Picturesque Appearance” Britton’s “Beauties of England and Wales“. “The RIBA Stirling Prize was born in 1996 out of its predecessor The Building of the Year Award. The Building of the Year Award had been running since 1988 and the winner was chosen by the RIBA President from a handful of National Award winners. This was thought of as neither transparent nor democratic. The aim with the Stirling Prize was that the winner should be decided in an unbiased way, with different juries visiting the ‘midlist’ and shortlist. 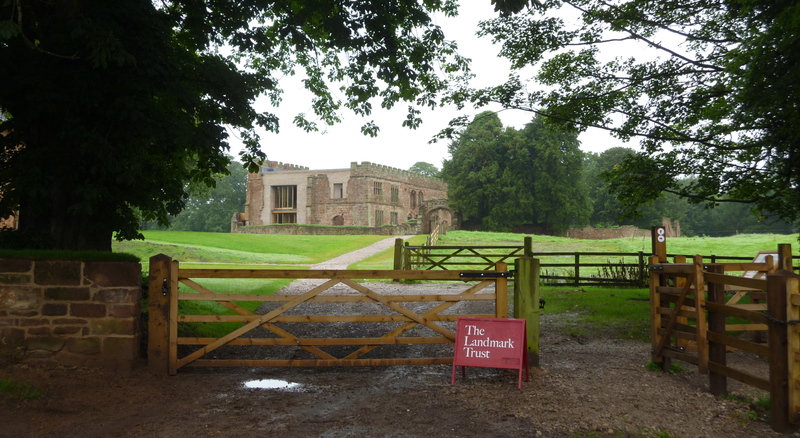 In 2012 I was fortunate enough to be invited by friends who are Patrons of The Landmark Trust to attend the celebration opening of Astley Castle in July 2012. Immediately on leaving the reception and arriving home I decided to book the castle for a week (Monday to Friday) in November 2013. Here are some of the highlights and light effects from this unforgettable stay. 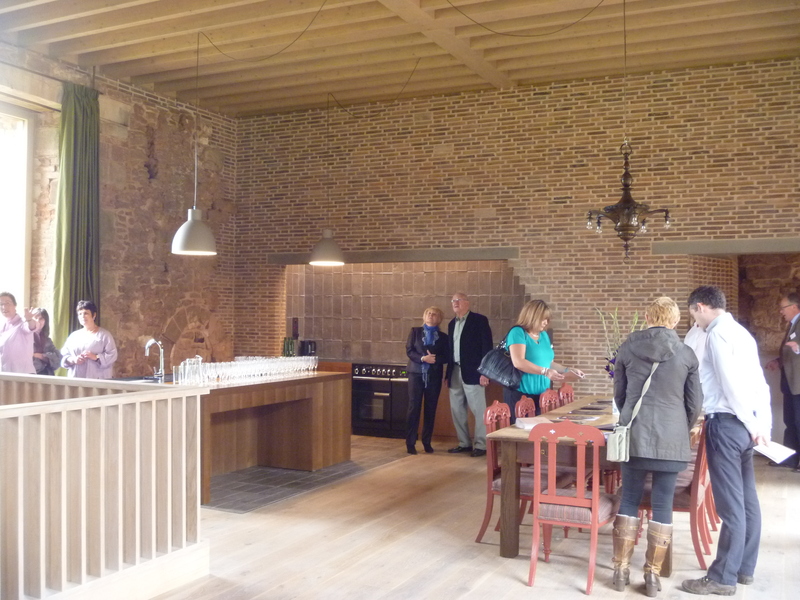 Last week I had the great good luck to be invited to attend the Opening Day of The Landmark Trust’s latest holiday property. Dating back to the 12th century Astley Castle near Nuneaton in Warwickshire has proved to be the biggest challenge to Landmark, so far. It even proved to be a challenge right up to and including the Opening Weekend due to the waterlogged fields being unfit for visitors’ parking. 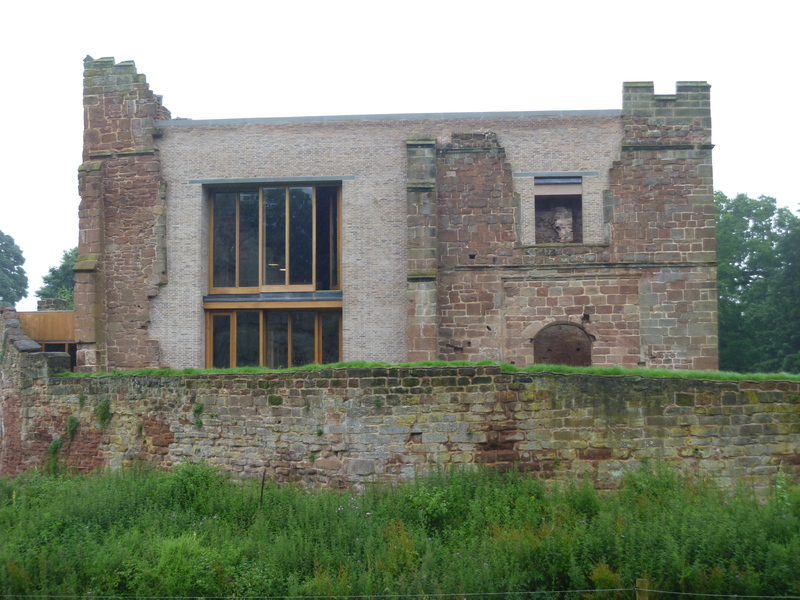 In the case of Astley Castle a completely new building has been inserted sympathetically into the medieval ruin. I first visited Astley in the mid-1990s when studying for a Masters degree in Victorian Studies. 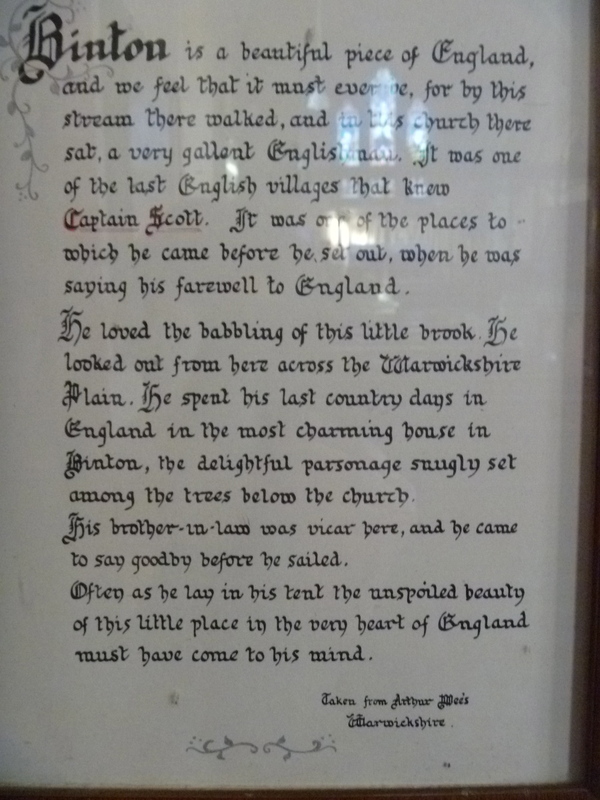 A ‘field trip’ to the places associated with George Eliot was planned and we spent the day visiting Coventry, Nuneaton, Arbury Hall and other places mentioned in her life and works including Astley church where we took in a view of the ruined castle. Astley Castle appeared in George Eliot’s story ‘Mr Gilfil’s Love Story’ as Knebley Abbey. The whole site is also part of the Arbury Estate, where George Eliot’s father, Robert Evans, was a farmer, surveyor and land agent and where the young Mary Ann Evans (GE’s real name) grew up. Since 2009 I have been following developments with great interest. 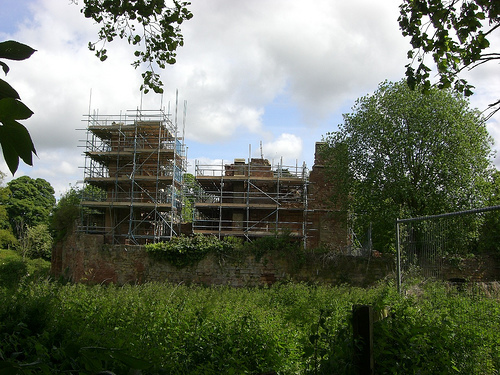 On a visit to the Midlands that year I stopped by after browsing the secondhand book shelves at The Astley Book Farm to find the ruin being stabilised by scaffolding whilst awaiting the raising of sufficient funds to begin the huge task of bringing Astley Castle back to life again. In October 2010 work was well under way when I visited with friends at the invitation of The Landmark Trust and we were given a guided tour of the work so far. 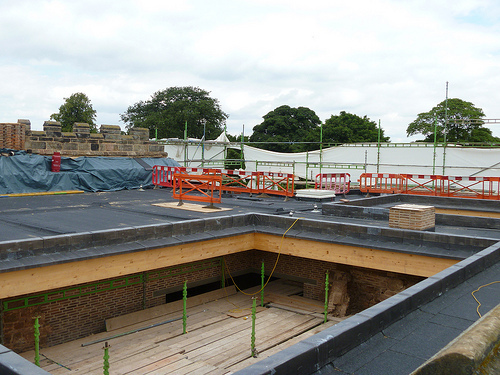 But in August 2011 on the next visit, amazingly, we were invited to climb to the top of the scaffolding and viewing the ongoing work from above – fluorescent jackets and hard hats compulsory! The day also included a lunch with Landmark’s Director at the time, Peter Pearce. 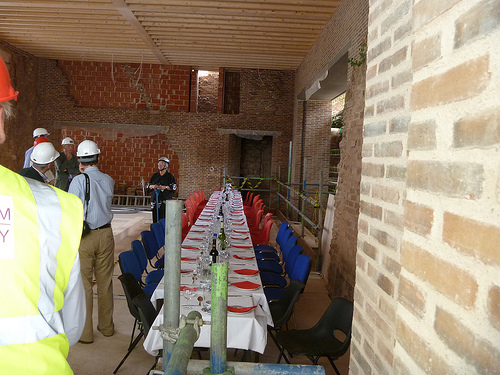 The lunch actually took place in the first floor sitting, dining room, kitchen. Alongside the work on the castle improvements were being made to the area around which now include public footpaths with information boards dotted along way and landscape features including a viewing mound and fish ponds and a lake. An Elizabethan knot garden of flowers and herbs has been planted near the castle. Hooray for Astley! 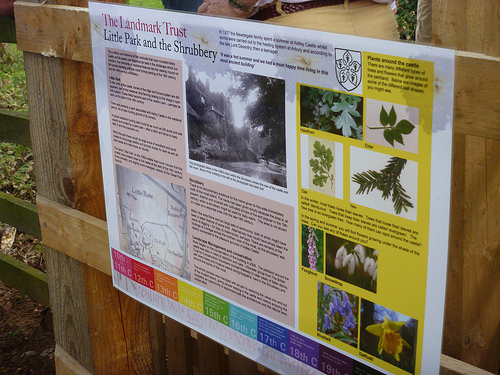 Hooray for Landmark Trust! Hooray for my Landmark Patron friends! Can’t wait to experience a stay at the castle for myself but that won’t be until the end of next year – it’s getting booked up very fast!! South of Bournville and a few miles west of Stratford and less than a mile from the River Avon, in the peaceful Warwickshire countryside, lies the little village of Binton. It is just a few houses (very nice ones, though! ), farms and a church. There is no longer a pub and no railway station, shop or Post Office. The church is Victorian and dedicated to St Peter. This quiet village seems an age away from the icy cold blasts of the Antarctic continent. 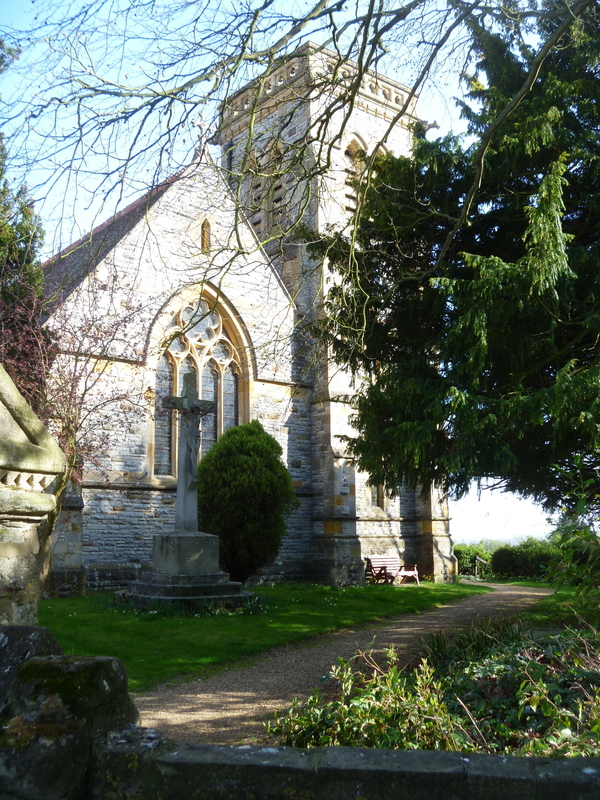 Nevertheless here in Binton’s satisfying little church is a further link with a theme that seems to crop again and again during this centenary year of Captain Scott’s ill-fated expedition. This village was one of the last places visited by Scott before he set out for the Antarctic. The reason was that his brother-in-law, the Rev Lloyd Bruce, was rector of the parish. 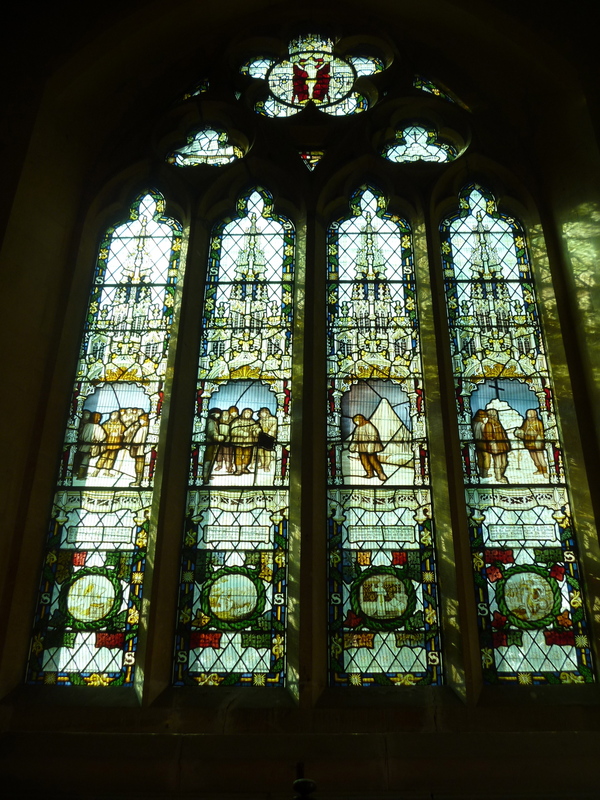 My friend had discovered that the church contained a set of windows designed and manufactured by Charles Eamer Kempe in memory of the Expedition and illustrating stages of the journey. 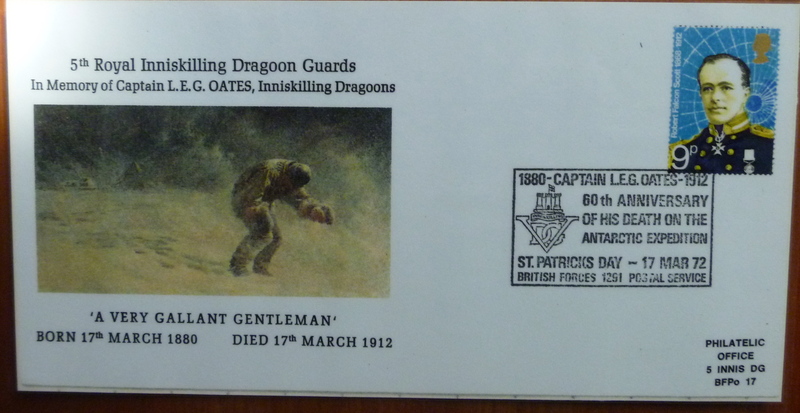 There’s a small exhibition telling the Scott story and illustrated with photographs, commemorative stamps and other memorabilia. 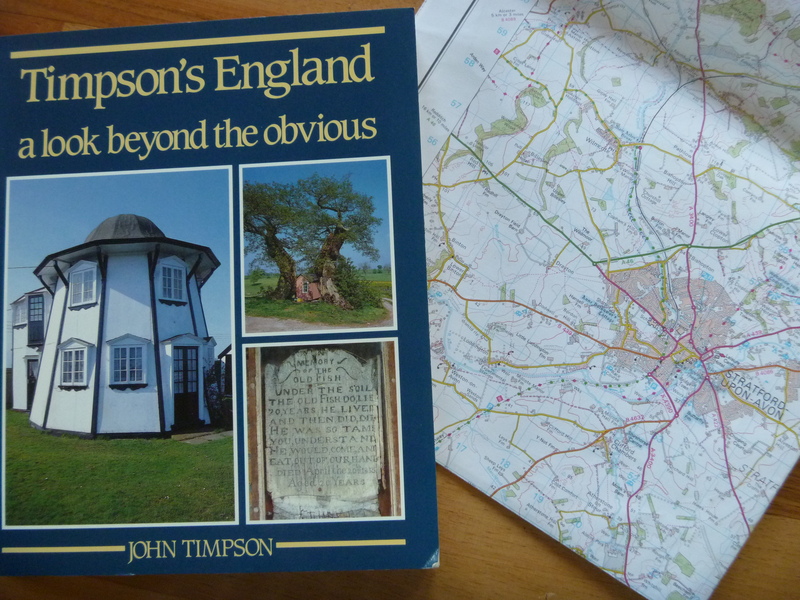 My friend discovered the existence of the memorial window so near to Stratford in John Timpson’s ‘Timpson’s England : a look beyond the obvious’. She, like me, is always out to discover hidden gems and the unusual whenever she travels around Britain and abroad.